Abstract. At the heart of many econometric models are a linear function and a normal error. Examples include the classical small-sample linear regression model and the probit, ordered probit, multinomial probit, tobit, interval regression, and truncated-distribution regression models. Because the normal distribution has a natural multidimensional generalization, such models can be combined into multiequation systems in which the errors share a multivariate normal distribution. The literature has historically focused on multistage procedures for fitting mixed models, which are more efficient computationally, if less so statistically, than maximum likelihood. Direct maximum likelihood estimation has been made more practical by faster computers and simulated likelihood methods for estimating higherdimensional cumulative normal distributions. Such simulated likelihood methods include the Geweke–Hajivassiliou–Keane algorithm (Geweke, 1989, Econometrica 57: 1317–1339; Hajivassiliou and McFadden, 1998, Econometrica 66: 863–896; Keane, 1994, Econometrica 62: 95–116). Maximum likelihood also facilitates a generalization to switching, selection, and other models in which the number and types of equations vary by observation. The Stata command cmp fits seemingly unrelated regressions models of this broad family. Its estimator is also consistent for recursive systems in which all endogenous variables appear on the right-hand sides as observed. If all the equations are structural, then estimation is full-information maximum likelihood. If only the final stage or stages are structural, then estimation is limited-information maximum likelihood. 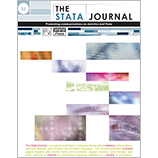 cmp can mimic a score of built-in and user-written Stata commands. It is also appropriate for a panoply of models that previously were hard to estimate. Heteroskedasticity, however, can render cmp inconsistent. This article explains the theory and implementation of cmp and of a related Mata function, ghk2(), that implements the Geweke–Hajivassiliou–Keane algorithm.